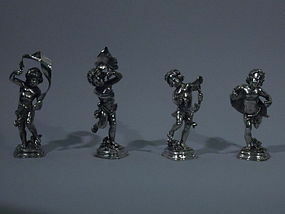 Set of 4 sterling silver figures of Bacchus. 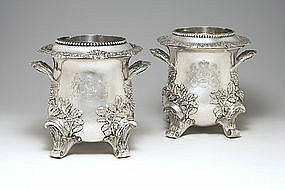 Made by Buccellati in Italy. A young Bacchus prances and gambols. One figure holds a grapevine. Another holds a large ivy leaf. The other two manipulate drapery. The infant deity, in all his manifestations, is buck naked apart from the artfully posed waistbands. Soft bottoms and stubby legs are on view. An attractive decoration for the wine cellar.